Fox's chunk of the Marvel universe is going to be busy. The studio just announced two new movies for 2017, including Fantastic Four 2, a sequel to The Wolverine, and a third, unknown Marvel movie in 2018. But what is it? 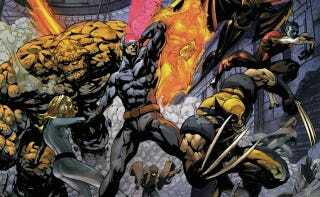 I think there are only two real options here: Either another stand-alone film based on an X-Men character, like maybe that Magneto movie that was in discussion a few years ago, or the rumored X-Men/Fantastic Four crossover. I find the latter a bit unlikely, since FF2 will be coming out in the same year, but I suppose it's possible they could shoot both movies back to back. But I'm still going to put my money on an X-Man, like Gambit or Storm. Which mutant do you think deserves his or her own movie?